Every week, I try to teach you something useful about old houses on The Craftsman Blog. Something you can apply right away to make your house that much better. This week, I’m going to do something different. There is a lot you can learn in a 500-800 word How-To post, but sometimes you just need to have someone show you in person. And that’s what I want to tell you about today. I’ve been mentioning it a lot on social media, so some of you may have heard about this. Coming up this weekend (Feb. 20-22 & 28) I will be at the Historic Homes Workshop in Tampa, FL. You can register here! This is set to be the biggest preservation event of its kind. There are preservationists from all over the world coming down to sunny Florida to help restore the Henry-Bryan House and you can be a part of it too! There will be classes covering everything from windows to masonry, so you can get some real pearls of wisdom. The best part of all this, is that participants will work alongside some of the greatest men and women in the field of window preservation doing hands on preservation of 13 wood windows. We will be working on-site at the Henry-Bryan House which was just barely saved from demolition by the City of St. Petersburg and Habitat for Humanity. The restoration work will be a part of the overall renovation of the house to make it a fit home for a new family in need. Fri. Feb. 20th 6-9 PM Preservation Party – There will be a kick off party where you can meet and greet all the preservationists and pick there brains over cocktails and hors-d’oeuvres. I’ll also be doing a book signing of my bestseller Living in the Past. Sat. Feb. 21st 9AM – 6PM Preservation Classes – With classes in 16 different preservation topics, there is something for everyone to learn. You pick the topic you want during each time slot and you get to follow your heart’s desire learning only the items you want to learn. Sun. Feb. 22nd 8AM – 5PM Hands-On Window Restoration – If you elect for the more in depth window track, we’ll be on-site at the Henry-Bryan House this day working hand-in-hand with a great team of preservationists restoring windows. Sun. Feb. 28th 8AM – 5PM Hands-On Window Restoration – It will take more than one day to get all these windows fully restored, so we’ll be back the following weekend to finish the process. Come to all of it or just come out for 1 day. Whatever you can do, you will learn a lot and have a great time with a wonderful group of people. 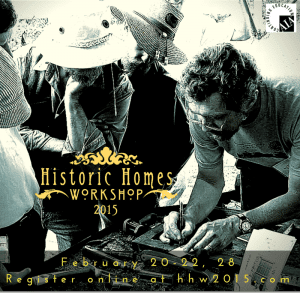 Check out the event’s website at HHW2015.com for even more information. This event is shaping up to be a huge thing in the empowerment of homeowners to take preservation back into their own hands and I don’t want you to miss it! One last thing…This event will be using my newest book Old Windows Made Easy as the guide for restoring the windows. I haven’t said a word about it before now, but if you sign up for the event, you’ll get a free copy of the book before it’s available anywhere else. Stay tuned next week for more info about the new book and when it will be available! I just got an email from the CEO of NORMI. He wrote a book called “Mold-Free Construction”. He says old houses were not meant to be mold-free. Houses most definitely were and are designed to be mold free. Old house or new mold is dangerous for humans and destroys wood. Thinking a bit more about it, I bet quite a few of us who can’t make it would be willing to part with some cash for some DVD’s. Sounds great, but I wish it was closer.